melodic stories that began with the first “Trio” CD. 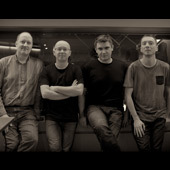 Here, on several pieces, they collaborate with tenor saxophonist Joakim Milder, who gained recognition in his work at ECM with the late trumpet player, Tomaz Stanko. Admittedly a fan of their musical style, this current release is nearly flawless, especially the empowering percussion of Michal Miskiewicz. The album opens with “Austin,” a beautiful tribute to the late young prodigy, Austin Peralta where Wasilewski’s haunting melody is precisely augmented, showcasing their skills in the trio format. 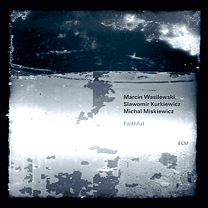 Marcin’s soulful finish is exquisitely enhanced by the percussive work of Miskiewicz, foreshadowing his brilliance. Wasilewski contributed five other original compositions, with “Three Reflections”and the alternate version of the title tune continuing to exhibit the trio. Milder’s deft integration with the group is first presented on “Sudovian Dance”…his solos seem effortlessly woven within the trio, allowing for individual expression but often syncopated. Listen carefully as the piano brilliantly interplays with the other instruments. 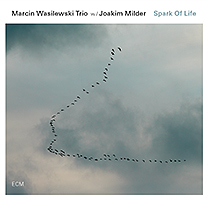 Two disparate versions of “Spark of Life” are presented in both quartet and trio format. It would have been a mistake to choose one. While Milder’s tenor adds a dimension to the composition, the interplay of Wasilewski, Kurkiewicz and Miskiewicz always binds this beautifully melodic, yet evocative free composition. 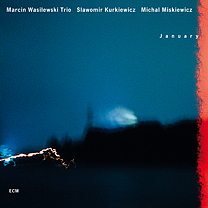 No better way to showcase the trio’s intensity than a brisk version of Sting’s castaway tale, “Message in a Bottle.” This is straight ahead, uptempo jazz as bassist Slavomir Kurkiewicz delivers an impressive transition to some highly energetic interplay between Wasilewski and Miskiewicz. Enjoy this ride! The most alluring quartet piece is a ballad from a Polish grunge-rock band named “Hey.” I will not attempt to interpret, just know that “Do Rycerzy, do Szalchty, do Mieszcan” is probably the most accessible piece of the recording, melodically delicate, but featuring some fine improv work by all. Krzysztof Komeda, the revered Polish jazz musician/composer, is known for composing the music for Roman Polanski’s 1968 film, “Rosemary’s Baby.” Komeda who died in 1969 at age 38, is also credited with bridging US and European jazz during that time period. The groups rendition of Komeda’s “Sleep, Safe and Warm,” from the film, leads with the trio before Milder’s tenor sound transports us to the seashore in a 1960s black and white European film. Beautiful piano-tenor interplay, a notable bass solo, all driven by Miskiewicz who controls the tempo (or tempos). There are two pieces reminiscent of past Herbie Hancock groups, the later composed by the piano master. “Still” has the appearance of a modern take on music from the quintessential Blue Note recordings like “Maiden Voyage,” an anthem of my early exploration of jazz. Herbie’s distinctive style is evident on “Actual Proof” with Miskiewicz’s skillful performance seemingly paying homage to drummer Tony William’s great work with those early groups. Manu Katche’. To my viewpoint, “Spark of Life” and “Forever Young” are two of the most significant jazz releases from ECM or any other label in 2014, though I am nothing more than an expert in my own taste. 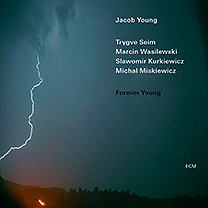 This entry was posted on Sunday, October 19th, 2014 at 6:44 pm	and tagged with ECM, Forever Young, Joakim Milder, Marcin Wasilewski, Wasilewski and posted in Jazz, Marcin Wasailewski Trio, music. You can follow any responses to this entry through the RSS 2.0 feed.